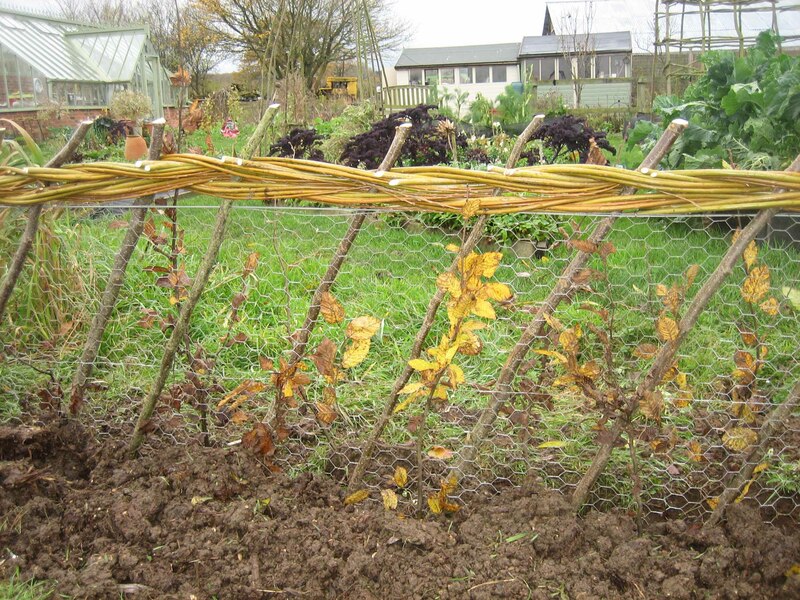 I’ve spent a couple of days recently building a rabbit net around a Bedfordshire veg patch. I was fairly skeptical to begin with, when my client suggested building a rabbit net that would be supported by hazel stakes and decorated with willow. However after some experimentation and discussion, we’ve developed a fence that I’m pretty pleased with. It looks better than your average rabbit net but will be perfectly functional in keeping those hopping rodents out. The temporary nature of the natural materials we’ve used has been overcome by planting a hornbeam hedge; the plants being alternated either side of the fence. As the hazel and willow fade away over the course of the next four years or so, the hedge will get cracking and thicken up. The theory is that the new branches will assist in keeping the wire in place but just in case this doesn’t occur, it’s hung on plain, high tensile wire. In the mean time, willow woven along the tops of the hazel stakes serves to hold things in place and look pretty attractive. There’s more to do, hopefully before Christmas. I’ll try to get a picture up here next summer, when the hornbeam comes into leaf. Think it’s pretty standard height – we’ll see! Actually there are plenty of places those bunnies can get in at the moment – the garden will need some clever gates. Some people think to grow something for them to eat but I am not so sure about this. This is really happening. This link is the story, but it is in Chinese. Summary of the story is: this farmer was troubled by field rats farming damage very much and then later he decided to leave some for them. So they only eat the row of corn and keep the rest of corn untouched. He still will care that row as the rest of the corn but will not harvest them. Rats will eat that row and eat some edible weed. Since the predators like hawks and snakes will eat rats, so the nature is quite balanced. It is very interesting and it is real. The story really make you think of sharing and natural balance!